Following years of negotiation, since 2012, the IA-CEPA was signed on 4 March by Trade Ministers Enggartiasta Lukita and Simon Birmingham. This Agreement now has to be ratified by the Parliaments of both nations. No sooner signed than Presidential candidate, Prabowo Subianto, stated that if elected on 19 April the document would be modified to protect Indonesia’s sovereignty and interests. There are prayers that Joko Widodo be re-elected as President. Currents swirl round this Agreement. Since the Dutch departure from Indonesia some eighty years ago Australia has had difficulty making friendly contact across the Timor Sea. For such close neighbours they are culturally and economically far apart. Raw data does illustrate the difference. Both are among the largest global economies, Australia 13th and Indonesia 16th, but the mismatch in population of 25 million to 250 million highlights the vast difference in living standards, virtually industrial to subsistence, but with a rising Indonesian ‘middle’ class. With current growth rates over 5%, Indonesia is slated to be the 7th largest economy by 2030. Australia wishes to exploit this growing market. In 1991, America and Europe anticipated vast new markets in the Russian Federation – alas history continues. Despite close proximity, Australia ranks 11th as an export destination to Indonesia and 8th as a source of export income to Indonesia. However, it is in Australia’s economic interest to more deeply penetrate this market. A recent estimate suggests there are some 300 Australian companies operating in Indonesia (12,000 in New Zealand) with a mere $11 billion invested in this 5,200 km archipelago. Bilateral trade historically has been low due to similar export profiles, incompatible culture and Indonesian government policy settings. In 2017-18 bilateral trade between Australia and Indonesia aggregated $10 billion, about 2.3% of exports. Australia’s principal exports are wheat, cattle, beef, cotton, seafood, sugar, aluminium and crude and refined petroleum; imports from Indonesia include crude and refined petroleum, aluminium structures, timber and footwear. Australia’s objective is primarily to increase exports into Indonesia couched in soothing language that will hopefully achieve a goal of “economic cooperation which will assist in the implementation of the agreement, support trade and provide a pathway for future liberalisation”. * a reduction of impediments to the exchange of services and investments. Indonesia’s reliance on food production and quest for self-sufficiency could present a prickly front door to Australia’s food exporters. The Indonesian breeding protocol is a problem for Australian cattle exporters. Each five cattle destined for a feed lot must be accompanied by a breeding cow: this is a significant financial impost on exporters. *Australia wishes to export agricultural produce, education and services into a rising market. This is starting from a low base, 2017-18 exports were only wheat $1.1 billion and cattle, sugar, beef, cotton, milk $1.6 billion. There was another $4.6 billion, aggregating 2.3% of total exports. *Indonesia wishes to increase self sufficiency and protect its important agricultural sector. * the Indonesian cattle trade has been opened up to India, Brazil, and Mexico. * wheat supplies can now be imported from United States, Canada, India and the Black Sea. * Indonesia favours local fruit growers by imposing seasonal restrictions, also local markets are being opened up to Northern Hemisphere producers. Indonesia’s insistence that the trade deal includes guest workers for Australia raises an issue. Germany, the Gulf States and other countries bring in workers for construction, agricultural and domestic industries thus relieving their own citizens. Australia relies on back packers, Pacific Islanders, Asians, and now probably, Indonesian labour to work where Australian youth is not wanted or where there are perceived travel and or accommodation problems. For Australia with a fiction of 5% unemployment (which hides underemployment) and a 10% youth unemployment and foreigners doing unpopular work, social issues in Australia will not improve. Another problem, Australia is among the highest in the OECD in terms of labour rates: not good for exports and a probable source of friction with itinerant labour. In a chance conversation, an exporter from America has stated that Australia is a difficult import market due to a plethora of bi-lateral trade agreements. A dark purpose might be revealed in a restrictive import policy that reduces Australia’s negative terms of trade. Australian Trade Relationships with Indonesia. Australian Parliament, 2018. Export Markets – Indonesia. DFAT, 2018. Indonesian Trade Agreement. New Daily, 2018. Several unwelcome messages have emanated from Forum 2019. 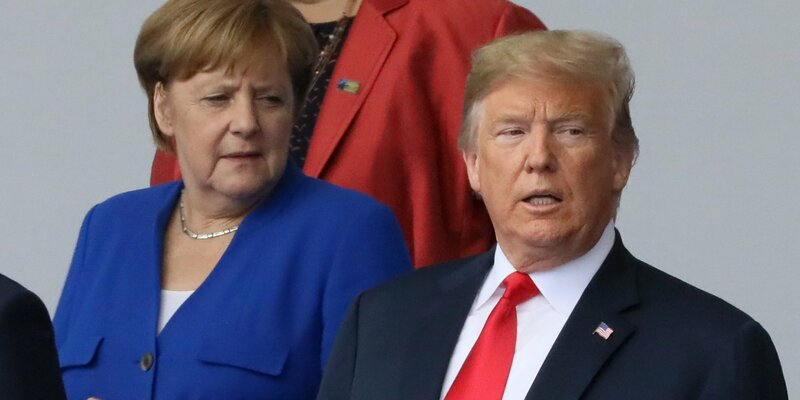 The Global Risks Report produced by the President records the World is ‘sleeping walking’ into a crisis at a time when the World needs more than ever multilateral cooperation to solve complicated global challenges as divisions in and between nations are hardening. Commentators used the phrase ‘sleep walking into war (crisis) in the 1930s as European nations watched events unfold into WWII. *The meeting between Prince William and Sir David Attenborough where the latest IPCC report was discussed. *The release by Bloomberg of information indicating that since the 2018 Forum, the poorest half of the world has seen its wealth fall by 11%. *An address to the Forum by Dutch historian Rutger Bregman urged the wealthy to stop talking philanthropy and pay more taxes. There was an adverse response from the assembled elite. Business leaders and Government officials had gathered in Davos to discuss and solve global issues, particularly the increasing inequality which is manifest by increasing global social instability. There is now comment that the World Economic Forum is becoming a symbol of ongoing global problems rather than a solution to them. In layman’s terms this year’s Forum agenda reads “The next phase of globalisation will occur in a society that has become increasingly disenfranchised and divided due to rapidly evolving technology advances and competition”. According to Professor Wesley Widmaler. Department of International Political Economy, ANU, the Forum is not addressing the neoliberal global framework which is central to global economic problems today. The Forum is trying to solve poverty and rising inequality by modifying failed concepts that have caused the problems in the first place. Since the 2008 GFC, the neoliberal system – ie free market capitalism – has proved to be unstable and unsustainable. There is recognition that the Forum is deliberating in a fractured world characterised by the breakdown of international institutions which were established after WWII in 1945. ( Professor Richard Holden, Department of Economics, ANU. The Conversation, 26 January 2019) Decisions at Davos have been taken on the assumption that the IFC, WB, WTO and others are as relevant now as they have been over the past 70 years. This is no longer true. Australia was present in force at the Forum. Finance Minister Corman, Trade Minister Ciobo and assorted industry leaders comprised the delegation that had hoped to promote investment and export opportunities for Australia.. The Ministers sought to attract big business to our shores to generate growth in the economy. Problems for investors will be Australia’s small domestic market, its requirement to develop export markets, high labour costs, power supply reliability, transport infrastructure and the 30% corporate tax rate, the third highest in the OECD. In early February 2016, ’17 and ’18 Australia hosted lavish seminars dubbed the A50 Economic Forum for international fund managers – no seminar appears to have been arranged for 2019. No follow up reports on major investments resulting from these meetings have been sighted. The problem for America is it cannot force companies such as Nokia, Samsung and Ericsson to cooperate whereas Huawei can provide hardware, chips and user devices which are equivalent to Ericsson, Intel and Apple rolled into one. There has been a decade long race between China and America to construct the 5G infrastructure. The prize is not only financial – successful companies will control entities that use the new technology. Critically, 5G will be vital for military and intelligence applications. Currently, the US Military depend on commercial telecom networks. The fear is that China could turn off the networks leaving the the US virtually ‘blind’. The bottom line is that China is poised to export 5G technology more quickly and cheaply and with more diplomatic support than Western firms. The dilemma for the Five Eyes is that, if they are unwilling to run military logistics networks without 5G technology, it will impact on their ability to sustain military partnerships abroad. The advent of 5G will tend to push the world into the American and Chinese spheres of influence – Treaty of Tordesillas reincarnate!! The big question is – will the World Economic Forum be able to stride this divide and can it continue with current economic philosophy? Manifestations of this nostalgia, cumulatively, are the growth of Far Right parties, white supremacist movements, polarisation between Socialist and Conservative politics, demonstrations and rallies over declining living standards, intractable youth unemployment, rising underemployment, a rising angst over automation and artificial intelligence, the implications of global warming, home ownership as a fading American and Australian dream and finally, the migration of alien cultures and religion into the fabric of European nations which is starting to destabilise Caucasian culture. What may not be appreciated by many is that the world after WWII in 1945, the implosion of the Soviet Union in 1991 and the GFC in 2008 have totally changed the world order and its institutions. Old alliances are now less relevant and distrust between nations has risen as evidenced by exploding arms procurement programs. Not yet given popular resonance is the increasing audible whisper that European economic influence is declining relative to Chinese and Asian population and their economic growth rate. This situation existed prior to the period of European maritime exploration and trade between 1500 – 2000. The wheel is now turning full circle! European governments and grass roots movements are seeking to counter this growing malaise by harking back to former ‘glory days’ which incorporate heritage, conquest, trade, the Enlightenment, industrial development and, if not too controversial, Empire. These reflections on the past are intended to instil confidence in the nation and working for the future. The rise and fall of the British, Russian, French, Spanish and Portuguese empires should not be regarded as isolated events but rather, they are merely part of a Homo sapiens continuum. The invasion and settlement of Canada, United States, Australia, Central Asia, South Africa, West Africa, Mexico and Brazil merely represents human activity over the past 8000 years. Since the commencement of the Common Era, excluding the Empires above, examples of invasion and settlement involved Romans, Mongols, Angles, Saxons, Vikings, Normans, Khmer, Bugis, Murghals, and Austro-Hungarians. In the fullness of time, conquest, collapse or assimilation reduced their influence. In the latter part of the 20th Century, Tibet has been invaded and colonised by the China and West Papua by Indonesia. An objective of a New World Order would be to reduce invasion and colonisation but this may be contrary to the instincts of Homo sapiens. An ironic twist – Homo sapiens is currently making plans to colonise Mars. Conquest and colonisation is in the species’ DNA. Australia is in an invidious position regarding this Celebration which will be wafted towards ‘We are One but We are Many” as a mantra to promote acceptance and camaraderie: a more substantive national ethos appears to be airbrushed out. The drive by European nations is based on a common ethnicity and a common culture. Australia shares this common heritage but due to growing ethnic diversity it is not politic to dwell on its cultural history and its projection into the future. Currently, due to the nature of early settlement, and until Australia’s history books are rewritten, the achievements of our very early pioneers may remain muted. *National Pride – confidence will be encouraged by commemorating past achievements, omitting political accolades, with plans of more to come. Australia is more than sport, far greater prominence should be given to achievement in Science and the Arts. The Armed Forces and their Battle Honours, not their peace keeping abilities, should instil national pride. *National Harmony – ‘We are One but We are Many” will suffer from repetition and group photos of cross cultural meetings will provide grist to this ditty. Declining self esteem and nostalgia are reported as an emerging problem among the European nations. The old social and political systems are in flux and Democracy is under challenge. The political class is now under close scrutiny. Politicians, by their nature, are usually unable to make complex decisions; there is a built in expediency with one eye on their electoral base. This is no way to run a complex system. Government must become more technical, independent of donations and less partisan for the 21st Century. The heyday of politicians unfit for purpose should be entering twilight tears as technical experts make rational decisions that affect progress and the wellbeing of the Nation. What has happened to Us. 2 January 2019. Geopolitical Futures. The uses of Nostalgia. 22 December 2018. The Economist. Perhaps the only threat that really unnerved the Government in 2018 was the School Children’s ‘Strike for Climate Change’ at the end of November. Thousands of our politicians much-vaunted ‘future generation’ came onto the streets to protest the ineptitude of the Liberal National Coalition. Our Government has no hesitation in standing by the riot police or the dog squad for normal demonstrations but when faced with thousands of children they were powerless. This flustered Government responded by an inversion of the incorrect statement ascribed to Marie Antoinette “Qu’ils mangent de la brioche!” Leader of an uncomprehending political hack was the Honourable Craig Kelly MP who informed ‘rioters’ that if they wished to make a difference they should give up hamburgers and ice cream. In terms of carbon footprint, there is an obscene comparison with the Honourable Kelly’s life style and that of the average school child. In recent times the Commissioner for Human Rights queried the ability of some who sit in Parliament. The Prime Minister appeared unsure of the drivers of the demonstrations; his flaccid response was that children should be less activist and return to class. Mr Morrison did not wish to recognise school children were aware of serious issues. The Honourable Matt Canavan, Minister for Resources, missed a unique opportunity to hold a meeting or put out an authoritative statement to address pertinent issues; instead he exhorted students to return to school to study science and mining. Somewhere in this mix it was put about that the Three Rs do not include Rioting. In all this there was no leadership and the Government lost a splendid opportunity to provide a meaningful message. In mid-2018, a fifteen year old Swedish schoolgirl, Greta Thunberg, commenced a movement “Strike for Climate Change’. Her movement now involves thousands of school children in Belgium, Britain, Japan, America and Australia. Thunberg recently addressed the Climate Change conference in Poland. This is a synopsis of her speech, measured and contemptuous: “We are small but we are going to make a difference. You only speak of green eternal economic growth because you are scared of being unpopular. You only talk of moving forward with the same bad ideas that got us into this mess even when the only sensible thing to do is to pull the emergency brake. You are not mature enough to tell us like it is. The Assembly before me speaks of crisis but you do not act as if there is a crisis. Even that burden you leave to us children, but it is our leaders who are like children. The objective of the Conference was to agree on a set of rules to ensure the conditions of the 2015 Paris Agreement be carried out from 2020. As Thunberg predicted the USA, Russia, Saudi Arabia and Kuwait would not accept the recent IPPC Report on the disaster that would follow a 1.5*C global temperature rise. Major polluters that show little sign of decrease are the construction of Chinese coal fired power stations and the slash and burn agriculture of Brazil and Indonesia. According to the BBC Sydney, the movement in Australia has been driven by three fourteen year olds from Central Victoria and Sydney. It has been argued by some that the demonstrations have been organised by Left Wing teachers. However, it is more rational to believe that this is a concern of school children across continents. Children have been bombarded by negative news programs and graphic documentaries – they cannot be unaware of serious climatic events which erupt into their living rooms. At school, environmental studies loom large. Northern Europeans are well aware of what is happening to the Arctic Polar ice and Australian students are aware of bush fire and drought. Australia has many bright students and they clearly see the link between climate change and Government ineptitude. Greta Thunberg’s comments resonate with them. Politicians, however well-intentioned or incompetent, realise that within twenty years they will be in cosseted dotage by 2040. 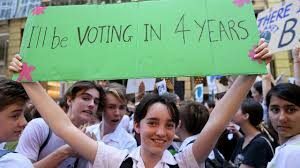 Todays fifteen year olds now realise that by 2040 they will be in their mid-thirties and will be suffering from the ineptitude and incompetence of Australian political elite. Placards messaging “Only four years before I vote” have resonance. If ideology rather than science prevails and Government flounders then demonstrations will become more serious. A democratic question: where can serious-minded school children take their concerns? Events in Western Europe that do not bode well are increasing Middle Ground unrest in Britain, France and Germany. Glaciers, rivers and social movements can merge. Suggested internet viewing – “Marc Brecy History of the world in two minutes’. MERRY CHRISTMAS & A COOLER 2019. The catalyst for this article is the slow corrosion in living standards and the rising discontent in Germany, France, Greece and Italy highlighted in ongoing press coverage. This information is related to the current malaise in the United States, Britain, Australia and for the French Department of New Caledonia. Controls on democracy were instigated with the first pictograms invented in ancient Sumer (4500-1500 BC). The written word was to facilitate the enslavement of the population. The French structural anthropologist, Claude Levi Strauss, considers that, within Homo sapiens, immutable deep structures exist which define what we are today. It was only in the 8th Century BC, that Homer’s Illiad & Odyssey were written down in Phoenician script to appear on the public stage: this was a first flowering of literature for the people. A democratic voice was only for landowners and advisors. The mid-1400s saw the invention of the Caxton and Gutenberg printing press. The Church and State now started to lose control of the population, however the ruling elite maintained brutal power. From the mid-eighteenth century with the coming of the Enlightenment, the industrial revolution and the evolution of political parties round a rebuilt British Houses of Parliament, political debate erupted around a slowly rising living standard. The rising middle class was a new steadying hand on the democratic process. Soon after the commencement of the industrial Revolution, it became clear that the Political Elite and Capital needed each other to stay in power. Labour is necessary to Capital but as the decades progress greater unrest is seeping into the system. The pay gap within the democratic system is becoming obscene. A definition: Democracy is a system of Government by the population of a State through elected representatives. (Oxford Dictionary. Until the Industrial Revolution, democracy and politics was a social science where ideology could flourish. Post the Revolution, social science has been replaced by technical science which is beyond the capacity of many politicians. And now, ideological policy is a stumbling block to the democratic process. Our modern democracy dealt with Tories and Whigs, then Conservatives, and then Conservatives and Labour separated by Minor Parties. This was a tetchy interface that is becoming more polarised now that a restless democratic electorate endures a slow decline in living standards while the transfer of wealth proceeds to the upper quartile. According to Geoffrey Sachs, noted economist, who addressed the Canberra Press Club on the 14th November, a principal opinion was that the United States might become a failing democracy. Initial democracy in America had restrictive similarities to that of early 8th BC Greece. The democratic system is now producing a rising Capital and Ruling Elite and an increasing fractious Middle America. The rising White Supremacy Movement now responsible for 70% of mass shootings, the Me Too Movement and the ongoing African-American situation and America’s place in a changing world, is producing pitched political battles. The Fed cut interest rates. Rates were held down for several years. Trillions of dollars of quantitative easing were pumped into the economy which over time reduced the purchasing power of the Dollar. Democracy is under siege. The Brexit proposal presented to the electorate was ideological not scientific – uninformed argument provided the very worst for an uninformed electorate. 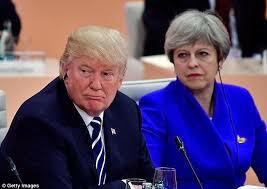 The support that brought Trump to power was similar to that in Great Britain –Rust Belt cancer and a jingoistic cannon, “We want our Sovereignty back”. The Brexit line was about jobs in the North of England. “Give us back Our Sovereignty” is a deep-seated issue harking back to shreds of Empire. 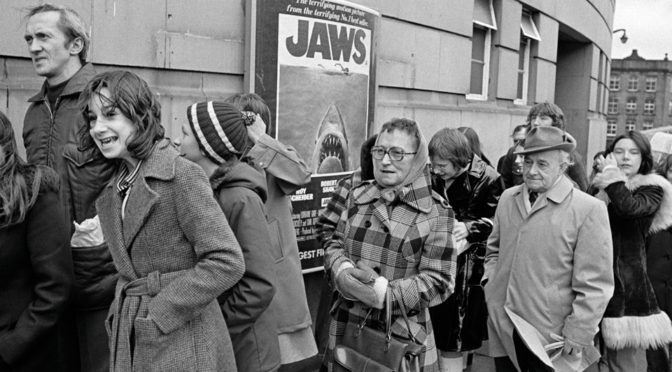 The electorate was entitled to informed financial advice. All it received was misleading ideology; this was a dereliction of duty by elected representatives. With an inconclusive vote (52 Leave to 48 Remain) this was not a clear result, many had not voted. The catalyst to Great Britain’s democratic system in the 18th and 19th centuries, was rising commerce and the living standard of Labour and a rising Middle Class. By the end of the 20th century the democratic system was under strain. Globalisation has put pressure on democratic systems since both Democracy and Capitalism can both operate best by upward improvement. With globalisation under discussion the concept has been raised that the Five Eyes might consider an Anglo-Saxon trading bloc. ex-colonial Hispanic powers is terrifying. For the Australian electorate, the political elite is not respected, ideology not scientific discussion rules debate, the opinion of experts is dismissed. The nation struggles on a bed of long overdue infrastructure. Like the other Anglo-Saxon trading partners, the democratic process has become more fractious as rising standards are not keeping up with expectations. 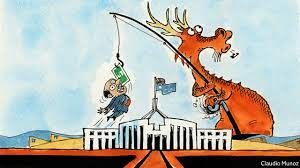 Fast forward from Sumer to Canberra and an article in WEA (24 November 2018), ‘Our Great Trust Crisis Hits Home’, illustrates the failing system of our Western-style democracy. It is a deep malaise. This process is skewed because 44% (indigenous Kanacks) require independence while 56% (mainly French settlers) want to remain under French protection and financial support. The New Zealand model for a democratic system is not an option where the population divide is Caucasian 74% and Maori 15%. For the foreseeable future democracy will wilt. Historically, the midnight 21 Gun salute, raising the National Flag and the Anthem, are euphoric moments before the normal daily poverty. The political elite (yesterdays’ freedom fighters) and the new security forces, quickly restrain a ‘loyal opposition’. In many Pacific cultures, “Big Men” are the source of power. In New Caledonia they will plan societal change. In the current political climate, Australia, New Zealand and France will quietly work to retain the status quo. The democratic process evolved out of the Enlightenment and the social conditions flowing from the Industrial Revolution. This system worked for some 200 years in a cocoon of rising living standards. 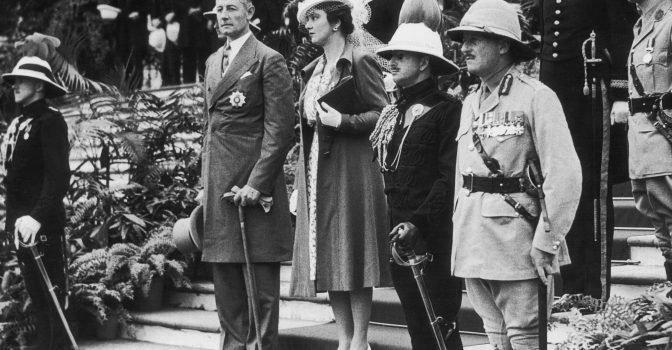 There was little resistance to the acceptance of democratic principles in the Anglophile nations. Now, all has changed due in part to declining trust between Government, Industry and the electorate. The deep social divide, due to immigration and dilution of national character, is causing intractable problems beyond the ability of our ‘social’ politicians. Electorates will be better served by technical politicians (managers) who will not use ideology. The symphony of democracy may not be in tune with Homo sapiens’ early development. There are deep socialogical issues. A forum, “Towards a Sustainable Australia, (29 November, 2018} was organised by the Royal Society of NSW and the Four Academies. The problems and issues identified were prescient to looming democratic issues. The Forum’s content highlighted core requirements for the survival of a stable democratic system. THE WEB – “NOT AN UNGOVERNED SPACE” – NONSENSE! On Wednesday, 10 October, the Hon. Peter Dutton, Minister for Home Affairs, addressed the Canberra Press Club on national and cyber security. The success of Border Force operations and the role of cyber crime was mentioned but there was no reference to the disastrous activities on the Dark Net with respect to drugs and child exploitation (hard candy). Both Ministers dwelt on progress by their Departments but both avoided mentioning the ‘elephant in the room’ – the Dark Net. This dark cyber space is more dangerous than the visible Internet and is capable of great damage to the Australian people but it is invisible and essentially uncontrollable. The Dark Net is a hidden unregulated encrypted network. The Global Internet comprises a vast cyber space where only 4% is available to the public; the remaining 96% consists of the Deep Net. 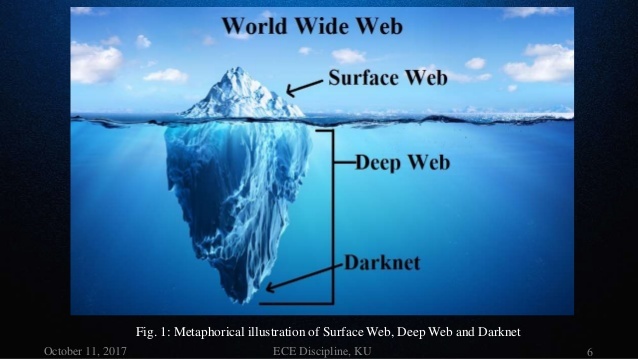 The Dark Net is only a sub-set of the Deep Net. The Dark Net is a space where total anonymity can be maintained using dozens of software layers, operating through hundreds of servers, transmitting encrypted messages managed by thousands of operators. The Dark Net is not visible to normal search engines but is entered using the TOR (The Onion Router) software developed by the US Navy to protect government information. Entry to the Dark Net is facilitated using a VPN (Virtual Private Network) which provides the user with a fake address and anonymity. 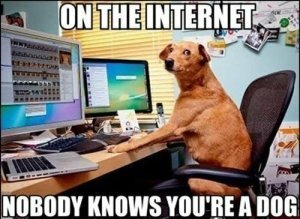 A Dark Web address can be identified by the suffix ‘.onion’, not ‘.com’, ‘.co’ or ‘.net’. The Dark Net is now the freeway for global organised crime. Recent investigations by Kings College, London, on nearly 3000 Dark Net sites found that about half were contacts for credit cards, drugs, guns, counterfeit money, malware and child exploitation. With the introduction of bit-coin, all transactions can be effected with complete anonymity. Not everything found was illegal, there were contacts for specialised clubs and and social networks! For public consumption Government Ministers utter soothing comment on 4% of the Internet. Serious crime and exploitation are emanating from a significant part of the invisible 96%. The Dark Net cannot be shut down. Australians have little protection except their common sense to protect themselves from criminals operating in the Dark Web. The TOR software is the legal gateway for the savvy and the gullible/ignorant to enter a dark space. Among the many material benefits created by Homo sapiens, it has created a rogue elephant, the Dark Net. This currently, cannot be destroyed or subdued because encryption and VPNs are not illegal. Government Ministers claim to be curtailing evil activities on the Internet but realistically this is about 4% of the Internet or World Wide Web. Ministers should warn that most of the Internet is, indeed, “Ungoverned Space” and we enter it at our peril. CAPTION. 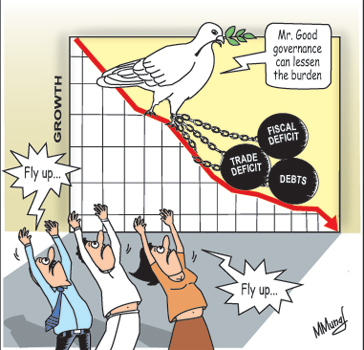 Good governance can lessen the burden. Fiscal Deficit. Trade Deficit, Debt. A pleasing set of numbers. Hockey, September, 2014. A terrific set of numbers. Hockey, June, 2015. The best growth rates since 2012. Morrison, September, 2016. Deficit reduction due to good economic management. Morrison, January, 2018. Excellent GDP rate of 3.4%. Frydenberg, September, 2018. The Devil in the Detail. In September 2014, Treasurer Hockey announced the National Accounts to be a ”pleasing set of numbers”. At the same time, the Reserve Bank warned of a dangerous housing bubble. Mr Hockey enthused that the GDP had risen to 0.5% for the June quarter but omitted to mention real GDP had fallen to 0.3% due to unfavourable Terms of Trade. In June 2015, the annual growth rate had risen to 2.3%. Treasurer Hockey enthused “this was a terrific set of numbers” and further stated the Australian economy was among the fastest growing in the world. The Treasurer omitted to mention that this period had seen the fifth quarterly drop in the Terms of Trade and that disposable income was now less than that after the GFC in 2008. Australian living standards were falling and national productivity had declined as growth was driven from low labour mining to intensive labour in tourism and hospitality. In September 2016, Treasurer Morrison enthused over the National Accounts informing Australians there was no sign of a downturn in the economy. The Treasurer noted that exports had increased slightly and imports had decreased. However, the Treasurer omitted to mention that Australians now had less disposable income so, ipso facto, lower imports were to be expected. In January 2018, Treasurer Morrison enthused over the success of Government economic policy in reducing the deficit. However, the Treasurer omitted to mention that there had been a spike in export commodity prices and that ATO income had increased due to the fact that company tax losses had now been fully absorbed following the GFC. The reduced deficit was due to good luck not good management. In August 2018, Treasurer Frydenberg enthused on the annual growth rate of 3.4% for the six months ending June 2018 and that this is on a par or better than Australia’s trading partners. Much more muted was a warning from the Reserve Bank that this result is partly driven by shoppers drawing down on their savings. This profligacy cannot continue. A Plea for Informative Economic Reporting. By immigration and small business development – unfortunately the money supply will churn, quantitative easing will be necessary and the currency will slowly devalue. By encouraging a domestic building boom – imports will increase putting pressure on the deficit (Terms of Trade), money supply will churn unless there is strong offshore buying. By irresponsibly permitting a savings funded retail spending spree. This is economic madness – the retail sector will benefit but the deficit will increase due to the import of foreign goods. Savings are finite! By generating infrastructure projects – overseas funding will be required which will increase the National Debt but, unless this infrastructure produces export income. the resultant economic activity will produce less useful domestic GDP. By encouraging strong export income. This is the Holy Grail. Unless the Government can encourage an increasing export, income wages will continue to flatline and increasing pressure will be placed on living standards. The Government trumpets its record on job creation We know wages are depressed and under-employment is increasing, but what we do not know is the breakdown of employment into jobs in the domestic economy and jobs in the export industries. With this information, there will be a better informed sense as to how the economy is travelling. The term Jobs and Growth is oxymoronic- the mantra must become “Jobs and Exports”. Current ABC ‘breathless’ reporting on the Lombok earthquake negligently omits information on the situation lurking beneath the surface. This article is a plea for balanced reporting. 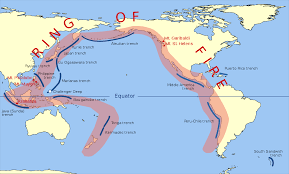 The equatorial Indonesian archipelago is part of the Pacific Rim of Fire with its associated subduction zones, earthquakes and volcanos. A subduction zone is formed where a continental plate collides with and is forced beneath another continent. The Australian continental plate is moving north a few centimetres a year beneath the Indonesian islands which form the southern edge of the Eurasian plate. As rocks are driven deeper they melt and then form lines of volcanos: earthquakes are generated as these molten rocks rise to the surface and create volcanos. As the Australian plate moves deeper into the earth’s crust, melting rocks form magma and produce gas and steam which start rising to the surface. This process will generate earthquakes. This could be the situation on Lombok this August. Volcanos along the Indonesian archipelago can produce and destroy islands. Lombok is an island comprised mainly of volcanic deposits; the island has a geological history of strong earthquakes and catastrophic volcanic eruptions. The geological record proves there were major eruptions around 4000 and 500 BC. In 1257 AD there was a catastrophic eruption (Volcanic Index 7) which vented more than thirty cubic kilometres of rock into the air to be laid down as pyroclastics and ash over four hundred square kilometres. Dust in the air caused the Little Ice Age in Europe and Asia which altered the climate causing mass starvation. During a ‘breathless’ press interview recently, a witness noted that ‘water levels had dropped’. 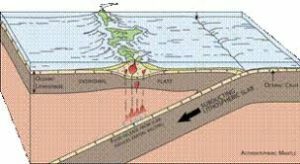 Certainly the current earthquake would have opened up old fractures and water will be available to generate superheated steam and set the scene for a phreatic explosion over the rising magma. It is reported there have been over 500 after- shocks. Are all these after-shocks, or are some shocks due to rising magma? Has anyone asked the question? Sumbawa island is close to Lombok island. It contains the fearsome stratovolcano, Tambora, which lies on the same subduction zone as Rinjani. A stratovolcano is a large volcano that has a long history of strong eruptions. Geological records indicate Tambora has erupted several times in the last 11,000 years – the Holocene. Major eruptions occurred in 740 and 1816. The 1816 eruption was one of the most devastating in recorded history with an EI 7. The eruption blew out thirty cubic kilometres of ash and pyroclastics and produced a caldera seven kilometres across. More than 100,000 people died from the volcanic activity and starvation. Other active volcanos, among many, are Agung on Bali and Krakatoa in the Sunda Strait. The map below shows the amazing number of volcanos along the subduction zone of the Indonesian archipelago. INDONESIAN VOLCANOS ABOVE SUBDUCTION ZONE. RINJANI & TAMBORA NAMED. ABC reporting is inadequate. There is no commentary on wider issues associated with subduction volcanism and its disastrous effects. The listening public deserves better. In 1990, the Soviet Union imploded and it was put about that this event heralded ‘the end of history’ – the reverse is true, international affairs are more complex. So too, the eruptions in 1257 and 1816 did not herald the end of subduction volcanism. 20 August. Two magnitude 6.9 earthquakes have again shaken Lombok on the 19th and 20th August. Since the end of July Lombok has been shaken by four strong earthquakes, 29/7, 5/8, 19/8, 20/8. The epicentre on the 5th August was shallow, taken in conjunction with a report on falling surface water levels this phenomena could indicate lava is rising beneath Mt Rinjani and water percolating through fractured rocks towards the volcano could cause a dangerous phreatic explosion. There will be more strong volcanic eruptions. The same herd of elephants in NATO head quarters will move to the President’s palace in time for the Trump Putin meeting. It is almost certain two important issues will not be properly addressed. The issues are the fallout from the unilateral decision by Present G W Bush to withdraw from the Anti Ballistic Missile Treaty in 2001 which spawned another arms race between Russia and America. The second issue is the annexation of Crimea and the destabilisation of Ukraine by Russia in 2014. Hot potatoes like North Korea, the Iran nuclear program, Russian interference in Syria, cyber security will be discussed at the expense of the really serious. The United States requires Europe to remain a strong strategic and financial buffer between the American homeland and the Russian Federation. Just as Russia requires Eastern Europe and Ukraine to be a buffer to NATO and China requires the Nine Dash Line as a first line of defence, so America requires the same. As a digression, China is increasing its influence in the Pacific Islands north-east of Australia which could affect the security of Australian maritime trade. In 2001 America withdrew from the Anti-Ballistic Missile Treaty in order to improve its missile defence systems as a precaution to counter the rise of terrorism. This inevitably triggered a renewed arms race which made Russia nervous of American military power. This has resulted in Russia upgrading its military capability that is now perceived as a threat to European security. Putin recently made an unusual reference to the development of anti-ballistic missile defence systems and other offensive military equipment. By contrast, a major US led NATO exercise, Sabre Strike 18, only involved 18,000 soldiers from nineteen NATO countries which were spread across Poland, Lithuania, Latvia and Estonia. The exercise was ‘a demonstration of commitment and solidarity to the alliance”. Prior to Sabre Strike 18, the Polish Government had requested an American armoured division (15,000 men and 44 tanks) to be based in the country to counter Russia’s increasingly aggressive posture along the border. The Polish document referred to Russian aggression in Georgia in 2008 and Ukraine in 2014. Last year there were only 30,000 American troops in Europe. (Business Insiders, 30 August 2017) This information may explain why NATO members must contribute 2% of GDP to increase its deterrent capacity. 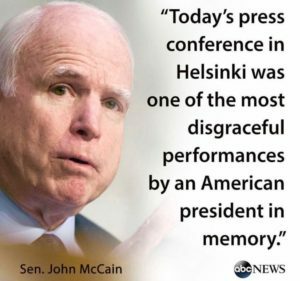 The flash points for discussion between Trump and Putin in Helsinki have been well aired. The elephants have now arrived at the Presidentinlinna from Brussels. While Trump made enemies in Britain, they will conclave to ensure that crucial matters will not be addressed. These matters are the destabilisation of Ukraine and the military build up by Russia along the Eastern European border lands. 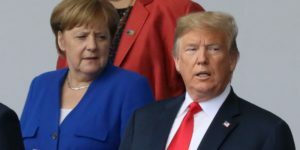 Irrespective of Trump’s view of deficient contributions by NATO members, the security of Europe is important to America as its primary trading partner; Russia ranks twenty-third. America must maintain the integrity of European borders. America has a special relationship with Ukraine which makes it surprising that America has permitted Russia to cross a ‘red line’ and annex Crimea and destabilise Eastern Ukraine. Trump should make it clear to Putin that these incursions will not be tolerated. Unless a hard line is taken, Russia will commence incursions into Eastern Europe – note Poland’s concern. American policy is complicated by America’s special relationship with Ukraine. Since independence in 1991, Ukraine has has been a good ally for the United States. The country gave up its nuclear weapons following the implosion of the Soviet Union and signed a non-proliferation treaty with America. In 1994, the Budapest Declaration signed by Russia, America and Britain guaranteed the sovereignty of Ukraine. Russia tore up this document with the annexation of Crimea and the destabilisation of eastern Ukraine. This has crossed a ‘red line’. In 2008, Ukraine supplied three battalions to the Iraqi Coalition and was fourth with ‘boots on the ground’ after America, Britain and Poland. Soon after, President Bush attempted to bring Ukraine into the Atlantic Alliance but this was not supported by Nato members. The Press Conference ended with a brilliant tactical move by President Putin when he threw a soccer ball to Trump with the quip “The ball is now in your court!” President Trump, almost expressionless, quickly threw the ball to The First Lady. Trump has returned to the Washington “Swamp” much discredited and to face the fury of many people. There was no meeting of minds between the two leaders; the incompatibility of ‘Make Russia Great Again’ and ‘America First’ ensured there was no common ground. Major international issues were virtually ignored as both leaders were mindful of their domestic politics and their support base. For Trump, this was a difficult meeting as Russian interference lurked just under the surface. It was probably Trump’s intention to blame the Obama administration for the poor relations between the two countries, not the Trump administration, but the message was lost in translation between the brain and the vocal chords. The move by Special Council Mueller to indict Russian agents threw Trump into confusion which resulted in Trump endorsing Putin’s view of the election interference situation. This was a PR disaster for Trump. Concerning ‘dirt’ on Trump – if there had been, the Russians would not have permitted the press conference to proceed. Strange as it may seem, Russia wants to increase Trump’s standing in the West as he is such a divisive influence: this assists Russian foreign policy objectives. In this sorry saga, real damage has been done to one politician, Trump. The electorate and his base know him and the latest ratings show him at 47%. Nothing much will change in the heartland but a deluge of comment can be expected from his critics. Post Helsinki nothing will change. The slow shift in power politics will continue, but if hostilities should erupt, then a little more rapidly. WILL LESSONS EVER BE LEARNT? Caption – Australia’s Bête Noire. Fishing in contested waters. The eruption of Mt Pinatubo, Philippines, in June 1991 leading to the departure of American forces from Subic Bay naval base and Clarke airforce base resulting in a military power vacuum. A few months later the Chinese Government reinvigorated the Nine Dash Line in the South China Sea thus increasing its influence over east Asian nations. Darwin port and the 99 year lease granted to the Chinese-controlled Landbridge Group for a paltry $650 million odd. Whispered plans for a Chinese military base on Vanuatu. 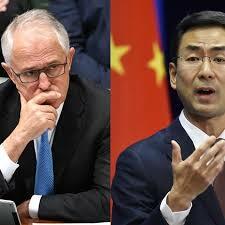 Huawei Technologies Co Ltd and Australia’s politicians visits to China. The publication of Silent Invasion by Dr Clive Hamilton. Australia’s recent arm wrestle with Huawei to construct a $200 million undersea communication cable to Papua New Guinea. Foreign Interference legislation passed to protect National Security. Comment will be restricted to the termination of Australia’s shortwave radio services to Pacific island nations and the predictable rise of Chinese influence by snapping up Australian shortwave radio frequencies. Larger issues flow from this. This decision will be shown to be a major diplomatic blunder by DFAT and the ABC. It reflects poorly on lessons to be learnt from history on the nature of ‘vacuums’ in geopolitics. In January 2017, the ABC formalised a decision to terminate shortwave radio services to the Northern Territory and Pacific nations to save an annual current cost of some $1.9 million. (aph.gov.au, Restoring Short Wave Radio) This decision was made before updated FM services were in place. The reason being the technology was old (but very effective) and would be updated by FM and digital at a future date. So, immediately, Papua New Guinea’s population of eight million (less 10% with internet access) and several million in other Pacific nations, were in radio silence – not a good way to win friends and influence people. In Pacific nations away from principal population centres, Australia’s shortwave radio service was the only contact with island capitals and the outside world. This service was essential in times of disaster, political instability and security. For eighty years, since the 1930s, Australia has been providing this service to millions of people. The service has won friends, stabilised hearts and minds, promoted trade and national interest. Now we pack up our swags, leave a radio black hole behind us and provide the perfect environment where Chinese influence can flourish. While tedious, it is instructive to appreciate the extent of this radio black-out by Australia. Nations affected are Papua New Guinea, Solomon Islands, Vanuatu, New Caledonia, Fiji, Tonga, Samoa, Nauru, Kiribati, Micronesia, Polynesia, Marshall Islands and Cook Islands. Concluding this section, both ABC and DFAT have terminated a vital shortwave radio service apparently oblivious to social, trade and national security implications for a net annual saving of $2.8 million dollars. A vacuum has been created – drum roll for the Dragon. With Australia’s unwise relinquishment of shortwave radio, frequencies for the Pacific region Radio China International acquired these assets and is now broadcasting to Pacific nations on Australia’s maritime ‘turf’. This was to be expected as illustrated by the Mt Pinatubo eruption and the fallout from the military vacuum. China is seeking to become the the controlling power in Australasia; it has large resources at its disposal. Canberra is seeking to negotiate a security treaty with Vanuatu to address economic aid, maritime surveillance and defence cooperation. It is not impossible to consider Vanuatu could be used by a hostile power to threaten Australia. It has been reported by Australian military sources that China and Vanuatu are discussing a military base on this island nation – so far denied. Unrelated to the above! – China has financed a new cargo wharf on Esprito Santo and completed an upgrade to the international airport. China now owns more than half of Vanuatu’s $440 million foreign debt while, since 2007, trade between the two countries have increased six fold. To forestall Chinese intentions, Australia has committed to construct a 4,000 km submarine internet cable from the Solomon Islands to Australia. An extraordinary ‘big picture’ is emerging of Chinese influence, military aspirations and trading links involving Papua New Guinea, Solomon Islands and Vanuatu. These island chains control the north-eastern maritime approaches to Australia. The concept of land or sea barriers between warring states is older than the Roman Empire but still relevant today. Russia’s influence over the Intermaruim plus Ukraine has been a central tenet of Russia as a buffer against Europe. China has sought some security behind its Nine Dash Line. Australia had its opportunity to develop a buffer along the island chains of the Western Pacific but China appears to now be turning this situation on its head to become a security issue for Australia. There is now a discernible trend in Chinese policy – if it is not halted it will continue. Caption. Fair Go! Not another problem! The Nine Dash Line was reinvigorated into the vacuum created by America. The termination of ABC shortwave radio into the Western Pacific, created a vacuum now filled by Radio China International. The port of Darwin was acquired by a Chinese company without visionary regard to long term trade, security and geopolitical implications by the Australian Government. This unwise arrangement resulted in a mystified phone call —- Obama to Turnbull “What the devil is going on down there?” China now controls many of Australia’s former shortwave radio frequencies. The same question from America is again warranted. The corollary that follows is: how far will America go to protect Australia’s interests in the Western Pacific? spearheading a security network to bolster the Pacific Island Forum. providing 21 Guardian class vessels to twelve Pacific nations including East Timor. the recognition of Malaysia, Indonesia and Philippines as buffer states to the Dragon. upgrading the Lombrun Naval Base, Manus Island, PNG. by blocking (postponing) the construction of a Chinese military base on Fiji.